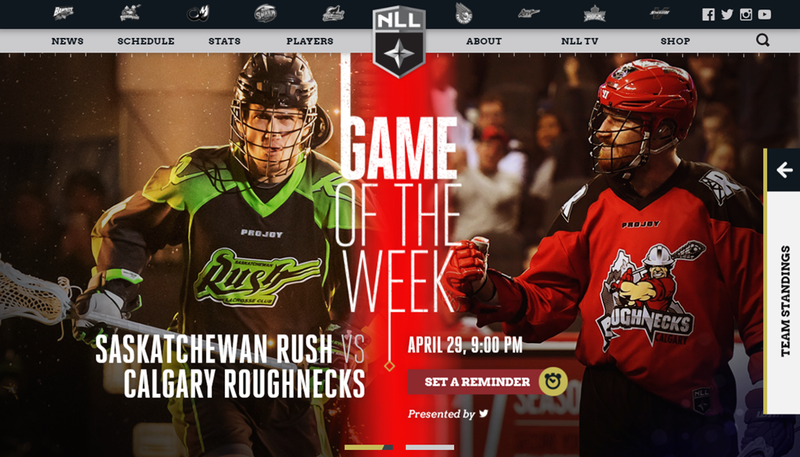 The NLL unveiled its new web site last week. We talked about it on the most recent episode of Addicted to Lacrosse, and of course I’ve spent some time perusing it this week. Here are some thoughts on the pros and cons of the new site. It looks great. The menus and the team standings thing on the right are slick. The images and overall look of the page are professional. I like how the black-and-white team logos at the top are colourized when you hover over them. Clicking on the team logos at the top gives you a page summarizing that team – record, goals for and against, division rank, news stories, roster, schedule, and staff (GM and head coach). There are links to the team’s web site and social media accounts, and links for buying ticket and merch. The NLL logo at the very top changes colour depending on the team you pick – nice touch. Each of the news stories on the front page has a little icon in the corner telling you whether it’s a video or text. The pages I use to download game stats into my database (nll_stats.stats.pointstreak.com/boxscore.html) have not changed, which means I don’t need to rewrite the script I use to fetch and parse them. This is a big deal for me personally, though I imagine nobody else cares. But for myself, thanks NLL! The list of games on the bottom of the main page scrolls left and right similar to the one on the old site but there’s no scroll bar or link to a particular week. To go back or ahead a month or two, you have to use the arrows on the left and right and just keep clicking until you get there. To get from the end of the season (where we are now) to the beginning takes 25 clicks. Sure, you can click on the Schedule menu. then select Week 1 from the WEEK dropdown and click Apply, but that’s still three clicks. Used to be one click for any week of the season. On this same list, games in progress are listed as “Live” with no indication of what quarter. Historical stats are gone. Career stats seem to begin no earlier than 2005. If a player retired before 2005, he’s just not anywhere. Finding historical players is a bit of a pain. To find John Tavares, for example, I have to go to the Players menu, select a season he played in, select Forward, and select Bandits (the latter two are optional but filter things much more quickly). If I want to find a historical player but I don’t remember what years he played or what teams he played for, it could take a long time to find him. When listing players, there’s no search field. If I want to find Mark Matthews, for example, I have to either scroll to the end, wait for the next page to load, then continue repeating that until his name shows up (this takes ten iterations), or I can filter with position and team. But if I could just type “Matth<enter>”, that would be faster. Even better if the ‘<enter>’ was optional. There are little progress bars on many images, showing you how long until the image changes to the next one in the “slideshow”. If something is actually loading, this is helpful but if it’s just a timer before the image changes, it’s not necessary. The times for goals, shots, turnovers, etc. are backwards, telling you how much time is left in the quarter rather than how much time has elapsed. The first face-off in Q1 is listed as 15:00 rather than 0:00. The turnovers and caused turnovers don’t have a name associated with them. The times are also incorrect in some cases – in Toronto’s 12-5 win over Rochester, we have Kyle Jackson and Brodie Merrill taking a shot on net and Billy Hostrawser and Merrill picking up loose balls all at 11:55 of the second quarter. When a goal is scored, no shot on goal is listed corresponding to that goal. The page is drawn as a small window above the main window but escape doesn’t close it. This also makes scrolling weird – using the mouse wheel scrolls the list in the window until you hit the top or bottom of the list, then it scrolls the main page behind the window. The tooltips for the twitter and star icons at the top say “Preferred_1” and “Preferred_2”. Clicking “Return to scoreboard” takes you right off the NLL page, over to stats.pointstreak.com. When trying to look at a game recap while the game is going on, the page refreshes itself automatically, changing pages as it does. Very annoying if you’re trying to look at something other than the “Plays” view. On the news page, the season filter is sorted ascending (i.e. most recent season at the bottom). Everywhere else it’s descending (i.e. most recent season at the top). I go to the 2015 stats and click on John Tavares, it lists his age as 48, which is his current age, not the age he was in 2015. That’s easy to calculate but which date do you pick? Do you display the age he was at the beginning of the season or the end? When I click on the search icon, I have to click on the text box that pops up before I can type anything. The text box should get focus automatically. The font on the transactions page is big and ugly. On the stats page it lists some team records, eg. goals for or against. For each record you see the top three teams along with, for some reason, their home arena. But the arena names are inconsistent. For the Bandits, it just says “KeyBank Center” but for the Rush it says “Sasktel Centre – Saskatoon”. From a quick Google search, there is only one SaskTel Centre. The Mammoth one says “Pepsi Center – NLL” and the Roughnecks says “Scotiabank Saddledome NLL”. We’ve all seen it before: the team that isn’t playing well starts getting frustrated and angry, and that leads to unnecessary penalties. That means they’re playing a man down for long stretches of time, and that doesn’t usually lead to anything good, so they get even more frustrated and angry, and so on. I don’t know what other people mean when they talk about “Banditball”, but that’s what that term means to me: the physical and undisciplined lacrosse that the Bandits became known for in the 2000’s. They generally don’t play that way anymore so the term is probably misleading and unfair now, but every now and again they revert back. But on this night, it seemed to serve them well. Last week on Addicted to Lacrosse, I talked a little bit about the circumstances surrounding the Ryan Dilks / Cliff Smith fight from last Saturday. I said that I was surprised that the Stealth ended up on the power play rather than the Rush, considering Matt Beers should have gotten a penalty for an illegal cross-check and Smith could even have gotten a third-man-in penalty (which is an immediate game misconduct and a game suspension). I didn’t say it in so many words but my implication was that the refs blew the call. The video from the fourth quarter from that game was not yet available so I couldn’t go back and see what actually happened, but it’s there now, so here’s my follow-up. Here’s what happened. Jeremy Thompson ran up the floor looking backwards, waiting for a pass from Ryan Dilks. He received it, turned around, and saw Matt Beers right in front of him. He dropped his shoulder a little just before they collided and Beers went flying. Thompson kept the ball and walked away slowly. Beers got up, came back over and cross-checked Thompson across the upper arm. Dilks took exception to the hit and went after Beers and while the two of them were chatting, Thompson took another couple of steps, dropped to his knees for a second, then rolled onto his back, clearly hurt. At that point, Cliff Smith got between Dilks and Beers and the two of them got into it. I can’t say for sure that any actual punches were thrown before they fell, almost on top of Thompson. Dilks got two for roughing, and Dilks and Smith got five each for fighting. Mistake #1: Beers hit on Thompson was a totally legal cross-check. No penalty was warranted. Mistake #2: Smith was not the third man in since Dilks and Beers were doing some pushing but not fighting. You can’t be the third man in in a fight when there’s no fight. Would I have given Dilks an extra two for roughing? Probably not, but I can see why they did. So the end result: The refs got it right, as they usually do. And I was wrong, as I… well, let’s just leave it at I was wrong. Calgary wins out, Saskatchewan loses to Vancouver, New England, and Toronto, and Colorado loses out. Then the Rush win the west at 10-8, Calgary is second at 9-9, and Colorado and Vancouver tie at 8-10. Vancouver would win the tiebreaker in that scenario with a 3-1 record against the Mammoth, so Colorado is out. Calgary wins out, Vancouver beats Colorado, and Colorado loses one more game. 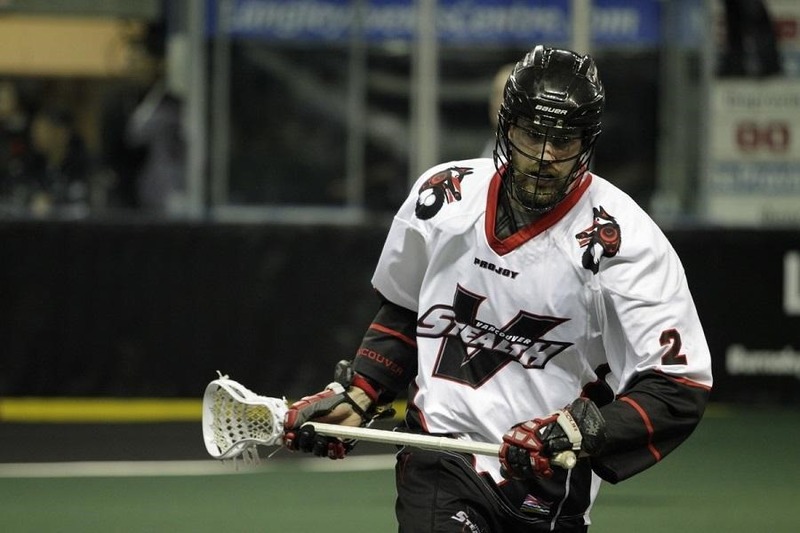 Then the Roughnecks are 9-9 and the Mammoth are at best 9-9, but Calgary holds the tiebreaker. Vancouver wins out, Saskatchewan loses at least three more, and Colorado loses to Rochester. Then the Stealth are at 10-8, the Rush and Mammoth are at 9-9, and the Roughnecks are at best 8-10. New England beats Georgia and Saskatchewan and loses to Vancouver. Buffalo beats Calgary, Toronto, and Georgia twice. Rochester beats Colorado, New England, and Georgia twice. Toronto loses to Saskatchewan and beats Buffalo. Then all the eastern teams are 9-9 and we have the nastiest tie-breaker ever. Rochester wins out. Toronto and Georgia lose out. Buffalo loses to Calgary. New England loses to Saskatchewan and Vancouver. Then Rochester, Georgia, and Buffalo are 9-9 while Toronto and New England are 8-10. Rochester has a 4-2 record against Buffalo and Georgia and wins the east while Buffalo finishes second and Georgia third. Buffalo wins out. Toronto and Georgia lose out. New England loses to Saskatchewan and Vancouver. Rochester beats New England and loses to Colorado. Then the Bandits are 10-8, Georgia is 9-9, and the rest are tied at 8-10. New England wins the tiebreaker and makes the playoffs. Update: Georgia has now clinched a playoff spot. Georgia loses out. Toronto beats Saskatchewan and Buffalo. New England beats Saskatchewan and Rochester. Buffalo beats Calgary and Toronto. Then Toronto and New England have 10 wins while Buffalo and Georgia are both 9-9. Buffalo would win the tie-breaker here and the Swarm are out.